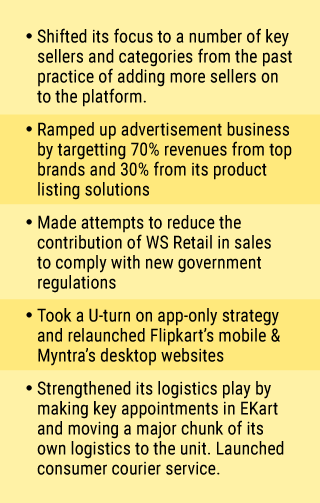 Faced with a slew of unsavoury developments â€“ from markdowns in valuation to an imminent threat to its market leadership and, from continuous exits at senior level to mounting losses â€“ Flipkart finally felt the need to clear the air. Binny Bansal, the cofounder who took over as the CEO four months ago, spoke out on Monday about the meaninglessness of markdowns, two business units of the company turning profitable and the efforts being taken to retain leadership in the country's fast growing e-commerce industry. In interviews to three newspapers, Bansal made light of markdowns calling it a theoretical exercise by small investor firms. Bansal insisted markdowns come into play when the company goes for a fresh round of funding and he said Flipkart was not in desperate need for cash. Bansal also said the company will be discontinuing the practice of using gross merchandise value as the metrics for business growth and instead, focus on net promoter score â€“ a metric to measure customer loyalty. Estimates suggest close to 60 million customers in India are buying products and services online. After taking over as the CEO earlier this year, Binny Bansal brought about few key changes in Flipkart's operations. Under the new structure, Binny headed commerce, logistics unit Ekart, advertisement, lifestyle venture Myntra, payments, HR, finance, legal, corporate communications and corporate development. His partner Sachin Bansal limited himself to fundraising and managing investor relations. In the past four months, Flipkart has aggressively tried to catch up with its bitter rival in India Amazon's global standards on customer service, product selection and fast product delivery. Besides, the company took the following steps to boost its operations. From unit economics point of view, Flipkart is still making losses. This means the company will have to raise capital to keep up the growth momentum and the recent markdowns in valuation might come to hurt it hten. Amazon's steady growth and entry of other players such as Alibaba and Rakuten can change the market dynamics, thus, making the company vulnerable. Flipkart needs to fix a number of things including retention of top talent before the battle gets even tougher.